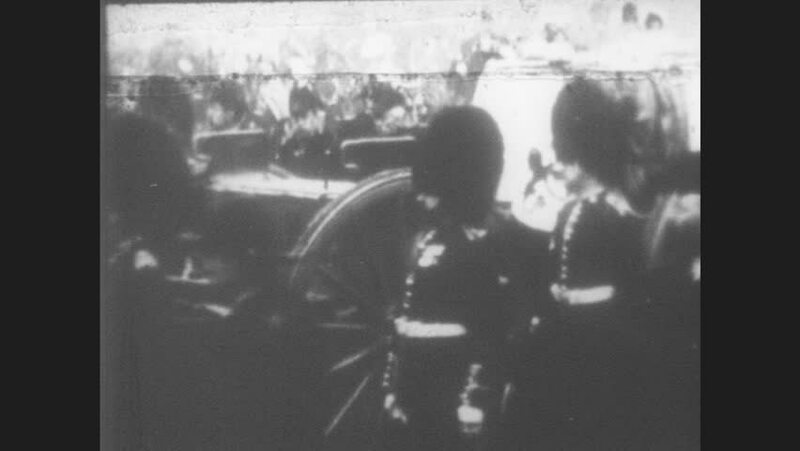 1950s: Funeral procession for Queen Victoria in casket travels by crowd in London. Royal soldiers ride in parade. King Edward VII rides horses with men. George V in a hunting party at a field. hd00:241920s: car and motorcycle chase up stairs in department store, across roof, leap buildings, crash floors and exit on wet road. bathroom explodes and floods. man rides bathtub through hallway rapids. hd00:191940s: Booker stands and talks to two men seated at desk. hd00:261950s: teenage boys and girls sit in desk chairs, listen to woman, rise up and exit classroom.